The trip between Edinburgh, located in Scotland and Nice, situated in France is well served by trains. Use our travel search engine to search for your ticket and see the rail company for this journey. 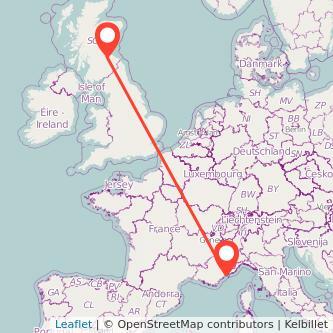 There are 964 miles between the 2 cities and the average journey time from Edinburgh to Nice is approximately 19h57m. Taking the train is often the fastest option to get to Nice from Edinburgh, and it's also a greener option than driving your car or flying. We found trains from £105.50 to travel in the next 30 days. Fares will change depending on the day and hour of travel and how far in advance you purchase your ticket. Find the cheapest tickets to travel from Edinburgh to Nice by train, bus, ride sharing and plane. We compare train ticket for all major companies to travel between Edinburgh and Nice by train and find the best prices for the coming days. Take a look at the prices of train tickets Nice to Edinburgh and find the best deal for your outbound journey.